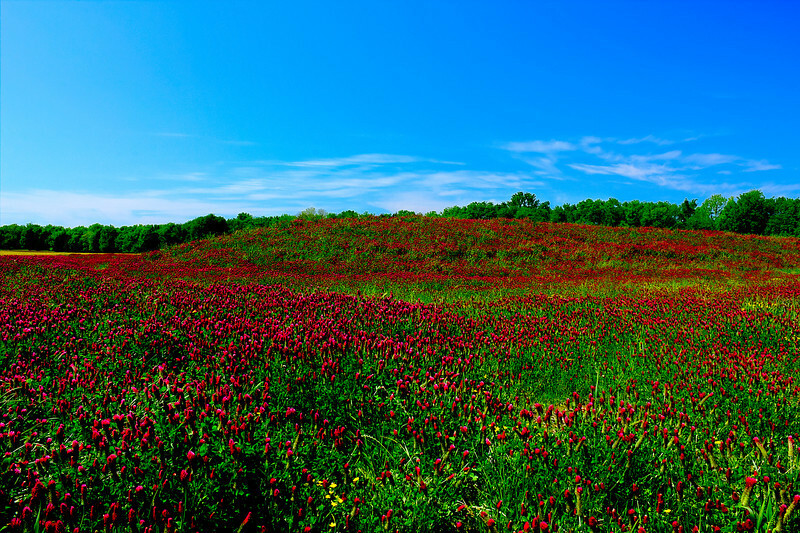 Field of Red Clover. In Mississippi part of the road beautification started in the 60's the state sowed red clover to help prevent soil erosion a practice still in effect today and as you drive down the road in the spring from border to border there are miles of red or yellow clover. This area is on Mississippi 45 south of Columbus, Mississippi and I had driven by it several times noticing deer lying in or eating the clover at dawn or dusk. One day in my travels I took the opportunity to capture the beauty of in a test for a sunset shot that I never got the opportunity to capture also, really awesome when seen live. This is a rare photo for I really do not like mid afternoon captures due to brightness but with camera at the ready already well I could not help but stop for the experience of the 50 mile wide screen view. Reds are the hardest to capture, that is yellow clover up to the left and I had to wait for some clouds slide in.